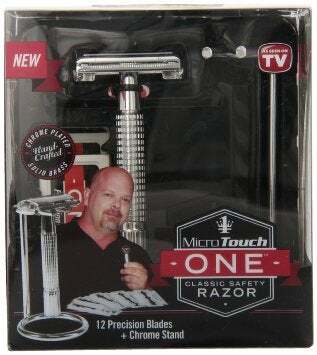 Rick Harrison will sell anything! And of course I bought one. It’s a cheap knockoff of a Gilette “Fat Boy” razor. This is not a bad thing as it makes a good travel razor. If you forget it somewhere you arent out a lot. Once it’s clamped down on a blade it feels pretty sturdy and can handle 5day growth with relative ease. Very surprising. The blades.. The included blades should be tossed in the trash upon opening the package. Get some Gillette or Wilkinson blades. Dont worry, these aren’t like modern Vibrating 10 blade monsters. A pack of 10 blades will set you back $6 or so and, for me, last about 2 months. Shave quality is very good. It didn’t clog with hair and if it does cleaning it is a simple twist and rinse operation. It’s a good value for someone that wants to ditch a modern razor and save a few bucks. You do have to re-learn shaving if you’ve only known the modern razor. If you think you’re just going to have a quick shave you will be bloody and unhappy. These require thoughtful and deliberate movements. After a while you may even want to upgrade to a vintage Gilette or Merkur you’ll like it so much.